The Irish Long Distance Swimming Association awarded this years English Channels Solo swimmers with medals commemorating the date and their swim time. 2010 award winners are: Ciaran Byrne, Gabor Molnar, Jennifer Hurley, Liam Maher (all Co Cork), Donal Buckley (County Tipperary), John Daly (Co Dublin) and Andrew Flanagan Co Galway. Well done and well earned! 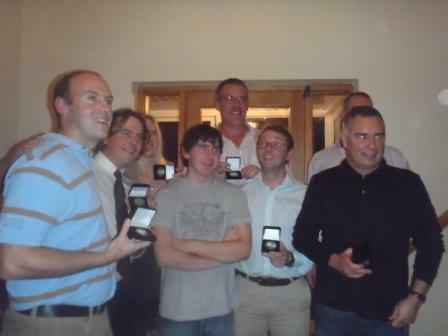 They were awarded to the swimmers by ILDSA Munster rep Owen O’Keefe on the 06/11/10. From left to right Ciaran Byrne, Gabor Molnar, Jennifer Hurley, Owen O’Keefe, Liam Maher (all Co Cork), Donal Buckley (Co Tipperary), John Daly (Co Dublin).